What started out as a pound bag of Valrhona Dulcey blonde chocolate fèves (pastilles) now contains nine whole, plus some broken fragments. If I was hoping to use them in an inspired chocolate creation, it would now need to be a very small one. From the Valrhona website: The first notes are buttery, toasty and not too sweet, gradually giving way to the flavors of freshly-baked shortbread with a pinch of salt. I rattle the bag, open it and stick my nose in. Mmm. A slightly toasty aroma like shortbread biscuits. I eat one broken-off piece. Not overly sweet. Toasty caramel taste. I let the fragment melt on my tongue. None of the creamy sweet flowery white chocolate flavour, this has a little edge of burnt sugar and toffee. I really must get another bag. After a trip to Gourmet Warehouse to replenish the stock (where I was admonished not to give my partner a hard time for polishing off a whole bag as they do it regularly) I pick up a half litre bottle of heavy cream and head home, an idea forming in the back of my brain. Maybe it is because we just got Netflix, and I have been indulging myself, watching multiple episodes of Doc Martin, a British TV series set in a fictional seaside hamlet in Cornwall, but I have been longing for clotted cream and for some reason, the caramelized chocolate seems like it will partner with it. I have had it only a few times in my life. My favorite memory of clotted cream was the graduation cream tea I attended in my last term of theatre school. The artistic director, Antony Holland, was originally from Devon (the county next to Cornwall in England’s South West corner) and it was a great honour to be invited to his home for tea, with his own renowned homemade clotted cream served with scones and homemade jam and long tall tales from the theatre. I’ve never forgotten the taste – a cooked, buttery, nutty incredibly rich taste, nothing like whipped cream. I have had it a few times since, when visiting Britain, but clotted cream does not travel well, and although tiny jars of it can be purchased here in Canada (for the astronomical price of $6 for 150 ml), it just doesn’t taste the same. Nothing for it. I must make some, and I am going to pair it with the Dulcey in a ganache. This may be horribly sickly sweet, or oily or just plain wrong, but I have a feeling it’s going to be good. Although by definition, clotted cream is made with indirect heat, it can also be made in the oven, overnight, at a low temperature. Make sure the cream you use has a high butterfat content (at least 33%, but preferably higher. If you can get 40%, buy it – you are very lucky!) and is not ultra-pasteurized (ultra high heat treated). Pour the cream into a heavy-bottomed oven-safe pan. The cream should come up the side of the pot somewhere between one and three inches. · Cover the pot and put it in the oven on 180 F.
· Leave the covered pot in the oven for 12 hours. You’ll know it’s done because there will be a thick yellowish skin above the cream. That skin is the clotted cream. 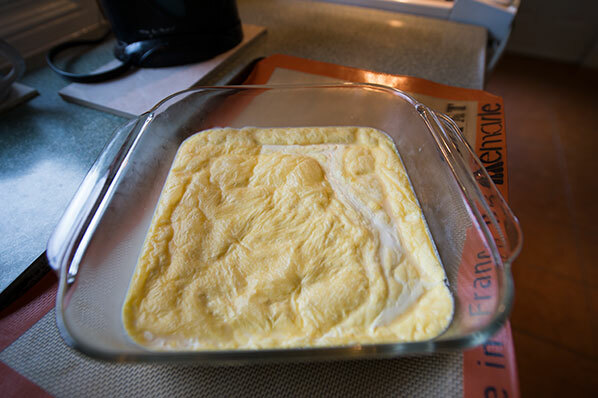 · Let the pan cool at room temperature, then put it in the refrigerator for another 8 hours. 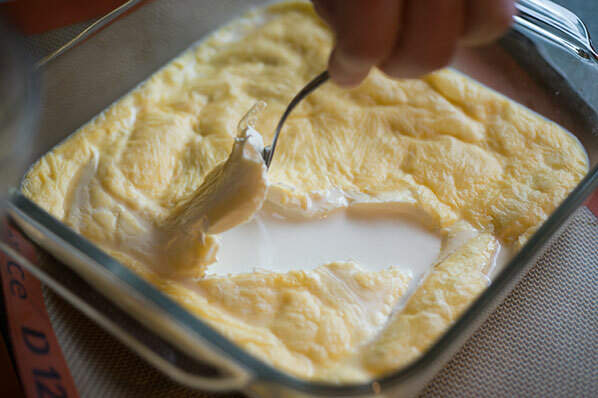 · Remove the clotted cream from the top of the pan. The cream that is underneath it can be used for baking. 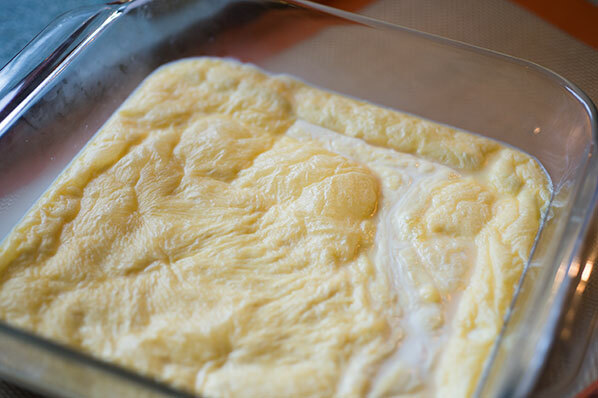 I used 500 ml of cream (Avalon dairies 36% organic whipping cream) in an 8” by 8” square glass cake pan with no lid. I have a convection oven, so I reduced the temperature to 170 F, for twelve hours. 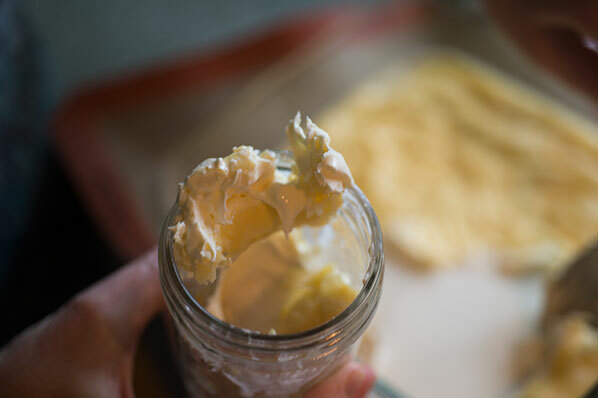 The resulting product was a thick yellow layer of cooked cream, which I spooned into a sterile glass mason jar. It had the consistency of butter, and made approximately 1 cup. There was a liquid layer (5/8 cup) of cream underneath the solid yellow top layer. I really wanted to “test” the clotted cream, so I made a batch of these very good plain scones using this leftover liquid. Mmm. Oh. The combination of cream/jam/scone is unbelievably good. The batch lasted about half an hour. But this is a mere sideline. On to the ganache. 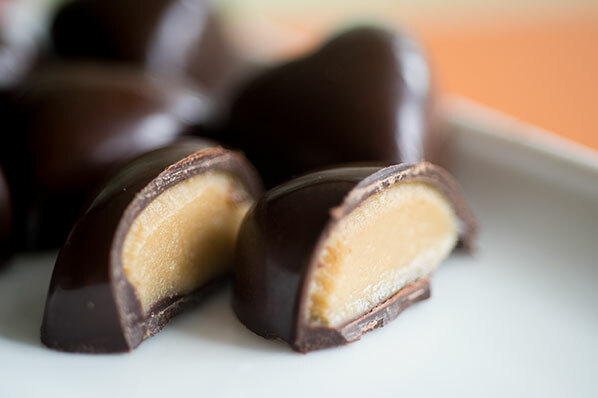 This is incredibly easy to do, and the resulting bonbons are unbelievably rich, smooth, toasty caramelly, toffee tasting, with a hint of browned butter. Worth every calorie. Let the clotted cream stand at room temperature for 20 minutes, so it is not chilled when you add it to the chocolate. 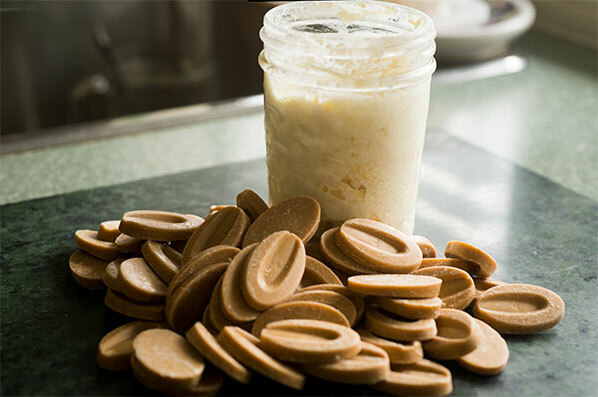 Melt caramelized white chocolate over a bain marie. Stir clotted cream into the melted chocolate in five additions. Stir well to a smooth consistency. I found I needed to use an immersion blender to create a good emulsion. 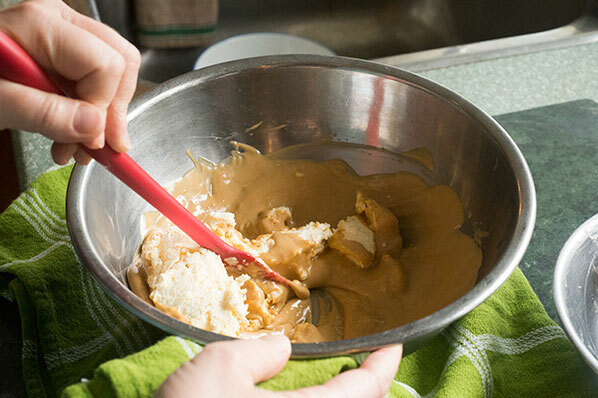 The resulting mixture will be the consistency of soft toffee. Let stand at room temperature, while filling chocolate molds. Once chocolate in molds has set, spoon ganache into mold cavities, and back with a layer of tempered chocolate. Unmold when set. If you do not want to mold these, alternatively, the ganache can be spooned onto a Silpat mat or parchment and refrigerated until firm enough to roll into balls. In a food processor, chop some good quality chocolate bars, to fine bits. 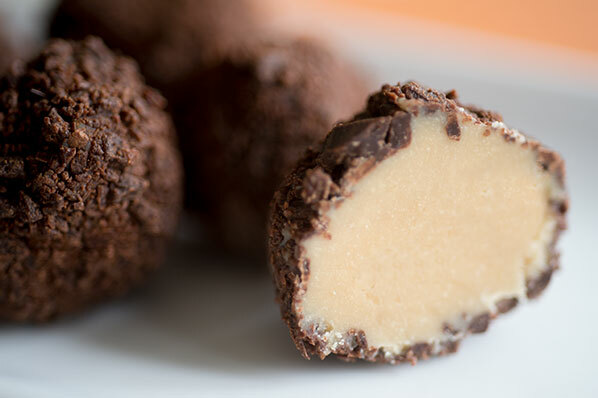 Roll ganache balls in chocolate bits and refrigerate. Eat straight from the ‘fridge! Ohhhhh, my goodness. In either form, these chocolates have become a huge family favorite and will not be going out the door … because there aren’t any left.